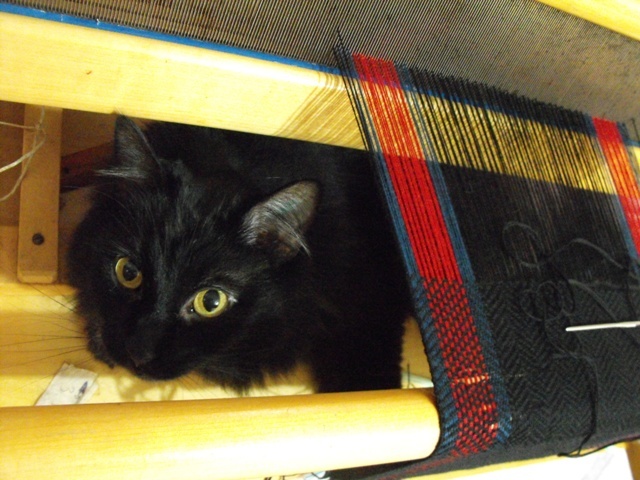 I have a table loom, which means that usually I can only weave fabrics that are up to about 20″ wide. 24″ if I really push it. 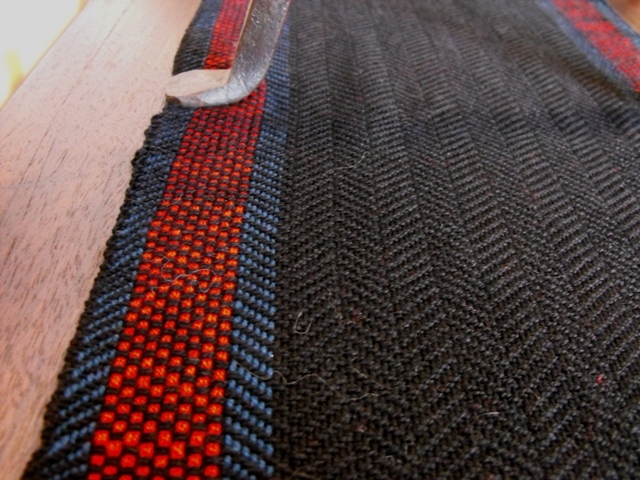 But there’s a totally magical technique that involves weaving two layers of fabric at once, doubling the width potential without spending a couple thousand dollars on new loom. Not to mention a new apartment that would fit a new loom. Though we could probably squeeze in one of these. Anyways, to make a short story short, that’s how we made this blanket. If you look really carefully you might be able to spot the slight line down the middle from where it was folded. 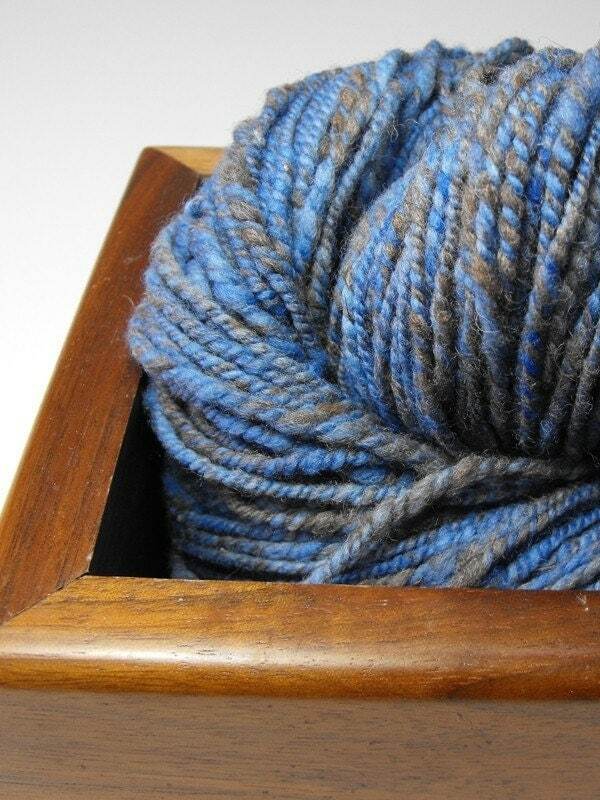 The weft is handspun Shetland, from a nearby flock. 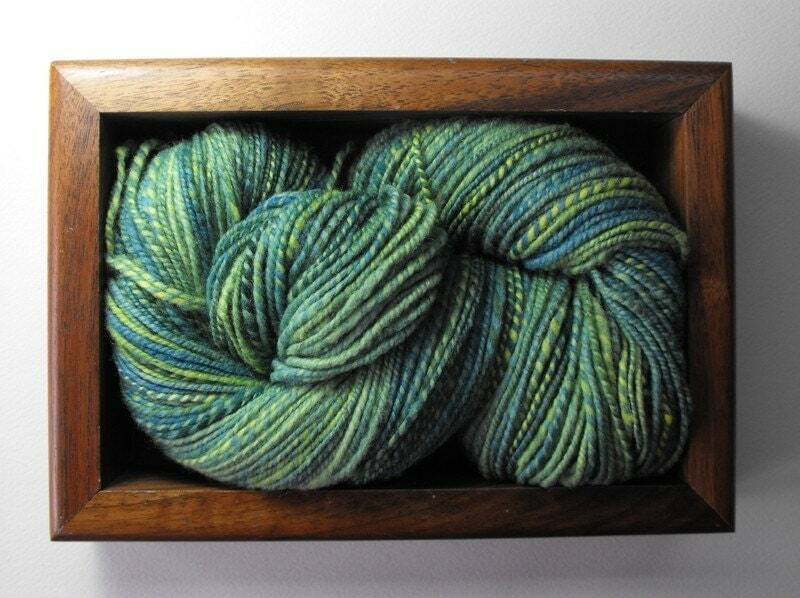 I got it at a fibre festival in March. 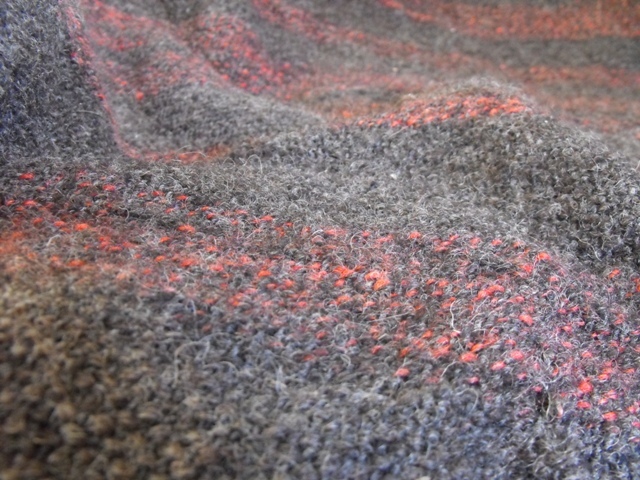 The red bits are some madder-dyed Corriedale that I had lying arond. The warp is from a cone that I got back in school when somebody destashed and brought a giant box to us and said “Here!”. 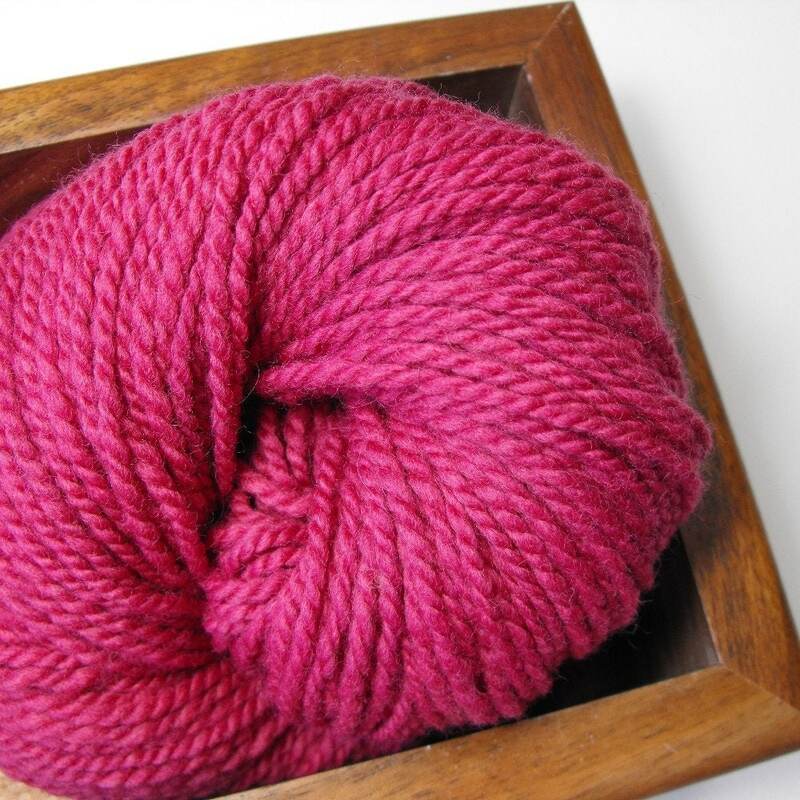 It’s a wool single (not plied). In case anybody out there is thinking about using a single for their warp, I’ll tell you a secret: Singles, as most spinners should realize, untwist when you suspend them with a weight on the bottom. So if, for example, your warp is a single, and one or two threads break so you do the normal thing, reattaching it and hanging a weight off it to give it some tension, and then you can’t figure out why the broken threads just keep breaking, think about that first sentence again. Yeah, it’s not breaking, it’s untwisting itself and drifting apart. Dummy. 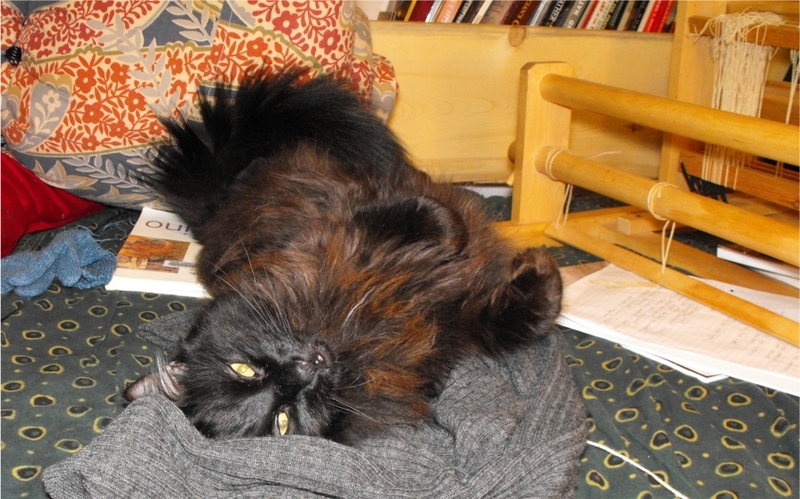 After washing it fluffed up quite beautifully. It’s wonderfully soft now. And number two: a runner for my new Fibre Chest in the living room ($15 plus several hours of sanding and staining – much better than small table piled in stuff). But wait! 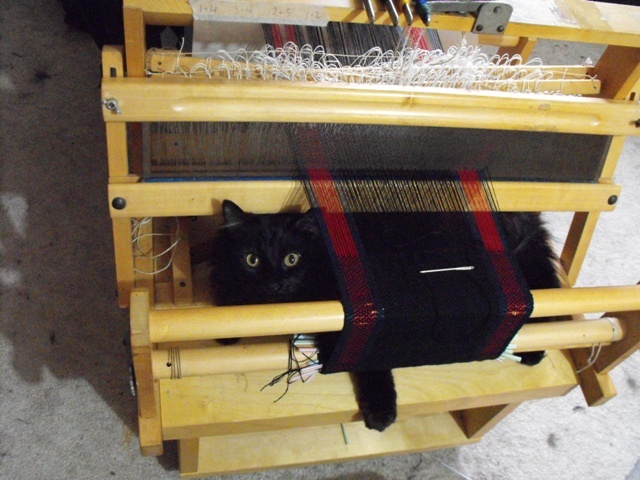 What’s that giant black blob under the loom? Apparently. Fortunately the claw marks mostly came out. Ta da! 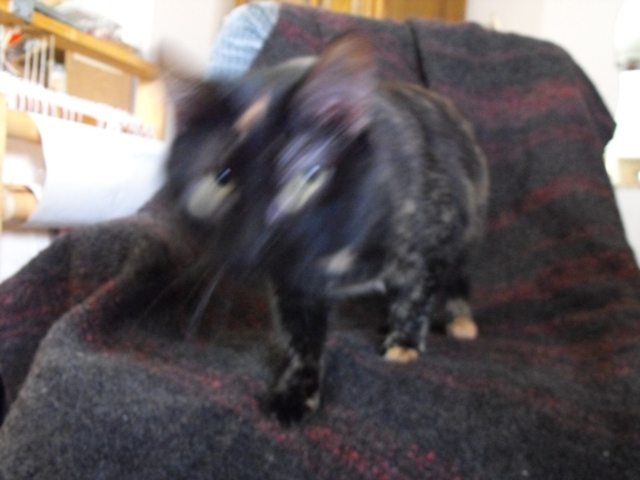 Oh look, there’s cat hair on it. Sigh. 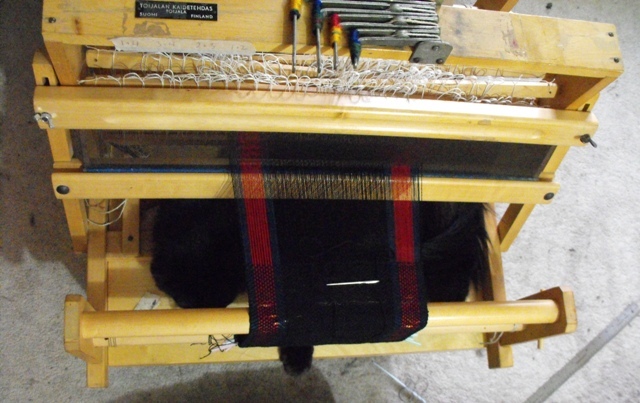 This here would be project #3 on the backstrap loom – project #1 was the tiny green strap I showed before, #2 was an actual backstrap (that’s kind of ugly, so I’m not showing it) and this is theoretically a bookmark. 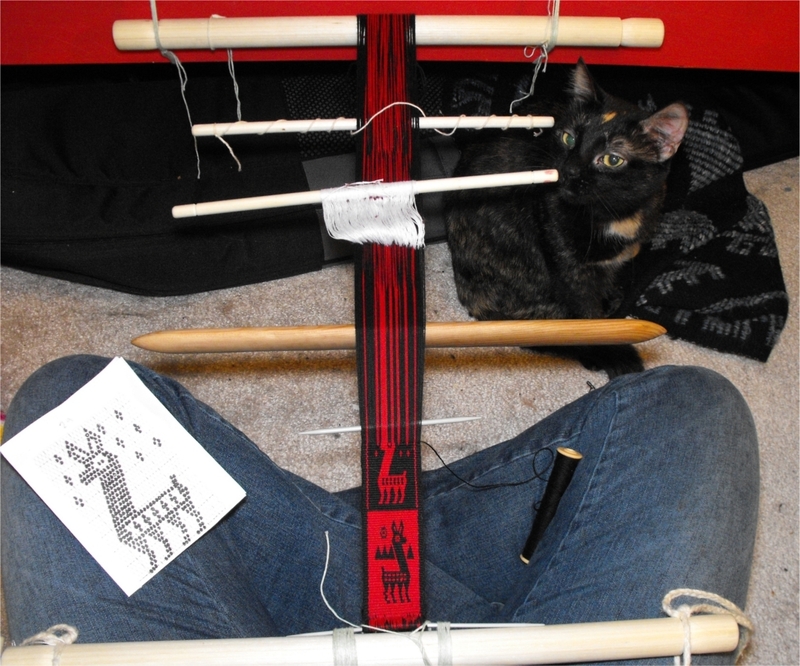 Mostly just trying to remember double weave, and figuring out how it works on one of these. You may also, should you choose to, admire the lovely shed stick/beater/sword that I made last week. 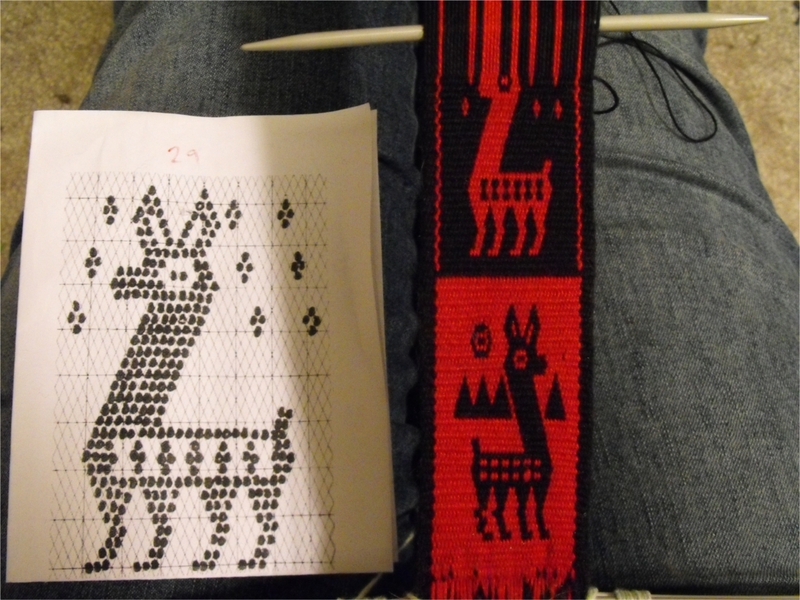 Here’s a detail shot of the weaving, but don’t look at the bottom llama’s back leg, it’s broken. I didn’t take a picture of it, but on the back is the same image, in reversed colours. That’s why double weave is nifty! 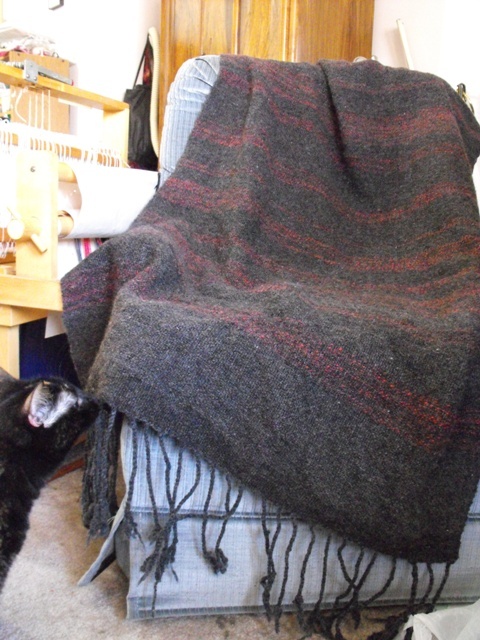 The pattern came from the backstrap weaving blog, like all the rest of my instructions. 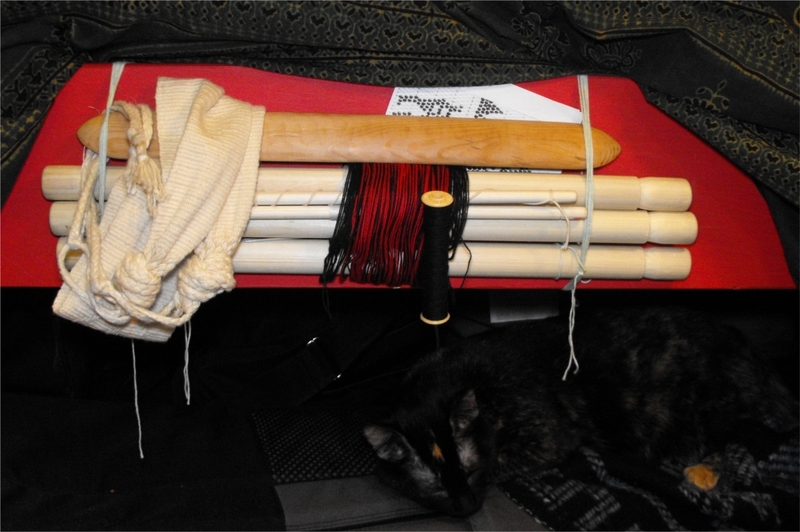 And for any of you who think that you don’t have space in your house for a loom . . .
. . . this is what it packs up into. That’s it, the whole thing. Tied onto my couch/bed. Cat not included. 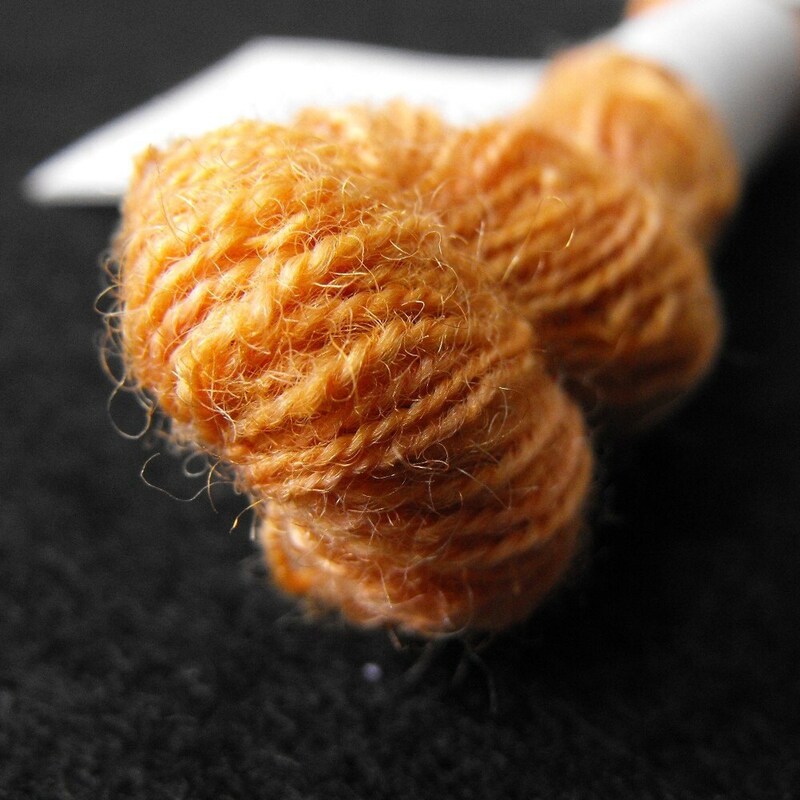 Unroll and use, roll back up, tuck in the ends, and store. 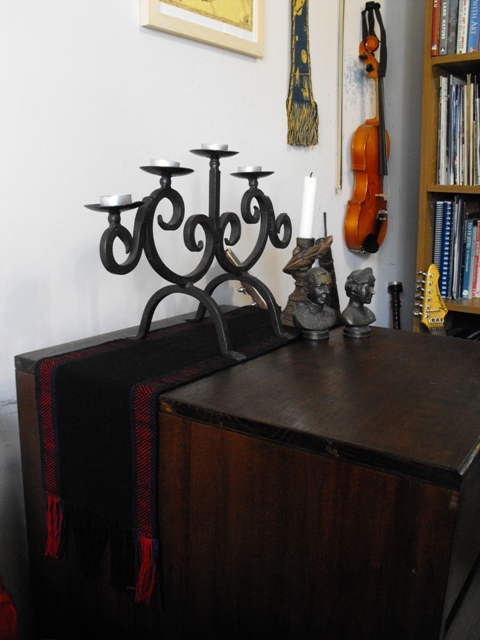 Nomad tools are awesome for apartment dwellers!